From the Dark is the first show I have ever reviewed that I have not seen. I can’t say I saw it because I was blindfolded throughout the show – and so was everybody else in the audience. And so was the Chilean magician Juan Esteban Varela, who devised the show. Varela was asked to devise a magic show for the blind. The show premiered in La Coruña, Spain, in 2010 and was so well received that it was decided that sighted people might enjoy the experience as well. That happened in Madrid in 2011 and there has been demand for the show all over the world ever since. We have to be grateful to Luminato and Magicana to have brought it to us. There is certainly no magic show in earth like it. If you think of any magic show you have ever seen, you’re memories will likely be entirely visual. The four main categories of magic tricks – appearance, disappearance, transformation and restoration – all involve seeing what happens. 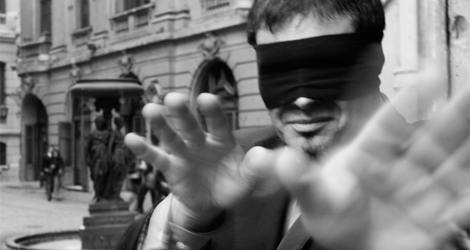 All the visual tricks also involve misdirection of some sort so that what the magician says or how he moves shifts our attention away from what he is actually doing or forces us to misconstrue it. In From the Dark, Varela is thus deprived of one of the magician’s principal means of performing an illusion. What is Varela’s ingenious solution? He uses direction, not misdirection, and the show consists of his instructing us, the audience, to perform magic ourselves. Before the show begins, various assistants called “guides” gather you into groups of ten. Before entering the theatre the blindfolds, really just sleep masks, go on. Holding hands with the person beside you and with a hand on the shoulder of the person in front you are led slowly to your seats by the guide. This is the most laborious process of the show but the guides have been trained to accomplish it efficiently. Then each audience member is given a small box about 4”x4”x3” fixed to a velcro strap that you fasten around one of your legs near the knee. On a command from Varela you open the box to examine the contents and feel that the objects needed for the show are all there and in place – a ring, a coin, a set of four cards, a small leather bag and a small plastic container like a drugstore pill bottle. There is a fifth category of magic trick, prediction, and that is the type that Varela, with many clever variations, primarily relies on. Varela makes much of the fact that we have entered a new realm. The guides give us new names before we receive the boxes and Varela’s first trick is to give us a new astronomical sign. The means he uses is a variation of the number games mentalists use but instead of numbers, Varela uses words. Using words, in fact, makes the trick much more interesting with 26 variables instead of 10. Substituting for sight are the senses of sound and touch. All the objects in the box are completely distinct in term of their feel. The way Varela has us make the coin disappear depends on sound. First we hear the coin make a rattling noise inside the bottle, then we don’t. I thought for sure that Varela would be unable to use that familiar technique of calling a person from the audience to join him on stage for a trick, but I was wrong. With the help of a guide a person did join him on stage and Varela performed a version of the trick where the magician guess in which hand the volunteer is holding a coin. He does this by having the volunteer open the hand holding the coin so that it drops with a dramatic clink on a table below. Perhaps the cleverest alteration of a familiar trick to allow it to be performed in total darkness is the change to the cards. Clearly, ordinary playing cards won’t work. Instead, the four cards in the box are plastic with images cut out in the centre so that we can feel which of four types they are. To tell front from back, one side is smooth and one side is rough. From the Dark offers the audience an experience completely different from any they may have had before. At the end of the hour, once you are led out of the theatre again and allowed to remove the sleep mask, no one could disguise the pleasure they had felt. It is the unique pleasure of having used the brain in an entirely different way. How many entertainments of any kind can be said to do that? This is a magic show that forces you to think about how we use the senses to process information. The one thing the show lacks is a way for the audience to thank Varela properly for devising such an inwardly enlightening experience. He thanks the audience in a very low key manner before we are led out. It would be possible to attend the show without ever seeing him. Fortunately, most people remained in the lobby and when Varela appeared they gave him the full resounding round of applause he deserved. Photo: Juan Esteban Varela. ©2012 Pedro Mancilla.